2 ^ While Amsterdam is the constitutional capital, The Hague is the seat of the government. 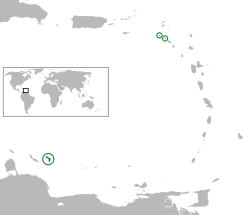 3 ^ Frisian (Friesland), Papiamento (Bonaire) and English (Sint Eustatius and Saba) have a formal status in certain parts of the country. Dutch Low Saxon and Limburgish are recognized as regional languages by the European Charter for Regional or Minority Languages. 5 ^ Before 2002: Dutch guilder. 6 ^ The United States dollar is the sole legal tender within the Caribbean Netherlands. Before 2011: Netherlands Antillean guilder. 7 ^ The .eu domain is also used, as it is shared with other European Union member states. Nederland is the European section of the Kingdom of the Netherlands, which is formed by the Netherlands, the Netherlands Antilles, and Aruba. It is a constitutional monarchy located in northwestern Europe, bordered by the North Sea to the north and west, Belgium to the south, and Germany to the east. The current borders were established in 1839. Amsterdam is the capital city (hoofdstad), and The Hague (Dutch: Den Haag or 's-Gravenhage) is the Netherlands' seat of government (regeringszetel), the home of the monarch (residentie), and the location of most foreign embassies. The Netherlands is often referred to by the name Holland. This is not terminologically precise, since the provinces of North and South Holland in the western Netherlands are only two of the country's twelve provinces. Nevertheless, Netherlands and Holland are names which have become popularly interchangeable when referring to this nation. Some 16 million people live in the densely populated and geographically low-lying country (its name literally means "low countries" or "low lands") that is known worldwide for its windmills, clogs (wooden shoes), dikes, tulips, bicycles, and social tolerance. Christianity flourished in the Netherlands even during the Spanish Inquisition. In the seventeenth century, it was known for its religious tolerance and became a refuge for the persecuted. However, its extreme tolerance has resulted in policies that are today in conflict with the beliefs of many Christian adherents: liberal acceptance of drugs, prostitution, homosexual marriage, abortion and euthanasia. The country is host to the International Criminal Tribunal for the former Yugoslavia, the International Court of Justice and the International Criminal Court at The Hague. A remarkable aspect of the Netherlands is the flatness of the country. Hilly landscapes can be found only in the central part and the south-eastern tip of the country. The country is divided into two main parts by the Rhine (Rijn), Waal, and Meuse (Maas) rivers. 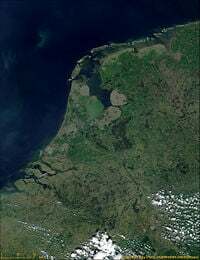 The southwestern part of the Netherlands is actually one big river delta. These rivers not only function as a natural barrier, but also as a cultural divide, as is evident in the different dialects spoken north and south of these great rivers and by the (previous) religious dominance of Catholics in the south and Calvinists in the north. The predominant wind direction in the Netherlands is southwest, which causes a moderate maritime climate with cool summers and mild winters. Approximately half of its surface area is less than 1 meter (3.3 feett) above sea level, and large parts of it are actually below sea level. An extensive range of dikes and dunes protects these areas from flooding. Numerous massive pumping stations monitor the ground water level. The highest point, the Vaalserberg, in the southeastern most part of the country is 321 meters (1,053 feet) above sea level. The Vaalserberg is a foothill of the Ardennes Mountains. A substantial part of the Netherlands, including all of the province of Flevoland (contains the largest man-made island in the world) and large parts of Holland, has been reclaimed from the sea. These areas are known as polders. This has led to the saying "God created the world, but the Dutch created the Netherlands." Over the years the Dutch coastline has changed considerably due to human intervention and natural disasters. Most notable in terms of land loss were the 1134 storm, which created the archipelago of Zeeland in the southwest, and the 1287 storm, which killed 50,000 people and created the Zuyderzee (now dammed in and renamed the IJsselmeer) in the northwest, giving Amsterdam direct access to the sea. The St. Elizabeth's flood of 1421 and the mismanagement in its aftermath destroyed a newly reclaimed polder, replacing it with the 72 square kilometers (28 square miles) Biesbosch tidal floodplains in the south-center. More recently parts of Zeeland were flooded during the North Sea flood of 1953 when 1,836 people were killed. The disasters were partially man-made; the people drained relatively high-lying swampland for use as farmland. This drainage caused the fertile peat to compress and the ground level to drop, locking the land users in a vicious cycle whereby they would lower the water level to compensate for the drop in ground level, causing the underlying peat to compress even more. The problem remains to this day. Up until the nineteenth century, peat was dug up, dried and used for fuel, further adding to the problem. To guard against floods a series of defenses were developed. In the first millennium villages and farmhouses were built on man-made hills called terps. Later these terps were connected by dikes. In the twelfth century, local government agencies called waterschappen (English: "water bodies") or hoogheemraadschappen ("high home councils") were established. Their job was to maintain the water level and to protect a region from floods (the water bodies are still around today performing the exact same function). As the ground level dropped, the dikes grew and merged into an integrated system. In the thirteenth century, windmills came into use to pump water out of the areas that were below sea level. 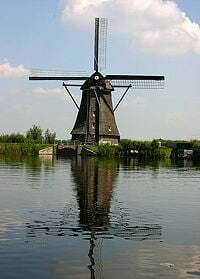 The windmills were later used to drain lakes, creating the famous polders. In 1932, the Afsluitdijk ("closure dike") was completed, blocking the former Zuyderzee (Southern Sea) off from the North Sea and thus creating the IJsselmeer (IJssel Lake). It became part of the larger Zuiderzee Works in which four polders totaling 1,650 square kilometers (637 square miles) were reclaimed from the sea. After the 1953 disaster, the Delta Project, a vast construction effort designed to end the threat from the sea. It was launched in 1958 and largely completed in 2002. The official goal of the Delta Project was to reduce the risk of flooding in Holland to once per 10,000 years (for the rest of the country, the protection-level is once per 4,000 years). This was achieved by raising 3,000 kilometers (1,864 miles) of outer sea-dikes and 10,000 kilometers (6,200 miles) of inner, canal, and river dikes to "delta" height, and by closing off the sea estuaries of the Zeeland province. New risk assessments occasionally incur additional Delta Project work in the form of dike reinforcements. The Delta Project is regarded as one of the largest construction efforts undertaken worldwide and is considered by the American Society of Civil Engineers as one of the seven wonders of the modern world. Some have argued that because of the high cost of maintaining the polders perhaps some of the deepest polders should be given up. Additionally, the Netherlands is one of the countries that may suffer most from climatic change. Not only is the rising sea a problem, but also erratic weather patterns may cause the rivers to overflow. These flooded polders might then be used as water catchments to lessen the impact of such disasters. Under Charles V, Holy Roman Emperor and king of Spain, the region was part of the Seventeen Provinces of the Netherlands, which also included most of present-day Belgium, Luxembourg, and some land of France and Germany. The Eighty Years' War between the provinces and Spain started in 1578. In 1579 the northern half of the Seventeen Provinces declared independence from Spain and formed the Union of Utrecht, which is seen as the foundation of the modern Netherlands. Philip II, the son of Charles V, was not prepared to let them go that easily and war continued until 1648 when Spain finally recognized Dutch independence. After gaining formal independence from the Spanish Empire under King Philip IV, the Dutch became a major seafaring and economic power in the seventeenth century during the period of the Republic of the Seven United Netherlands. In this era, referred to as the Dutch Golden Age, colonies and trading posts were established all over the globe. Many economic historians regard the Netherlands as the first thoroughly capitalist country in the world. In early modern Europe it featured the wealthiest trading city (Amsterdam) and the first full-time stock exchange. The inventiveness of the traders led to insurance and retirement funds as well as such phenomena like the boom-bust cycle, the world's first asset-inflation bubble, the tulip mania of 1636–1637, and according to Murray Sayle, the world's first bear raider, Isaac le Maire, who forced prices down by dumping stock and then buying it back at a discount. After being incorporated briefly in the First French Empire under Napoleon, the Kingdom of the Netherlands was formed in 1815, consisting of the present day Netherlands, Belgium and Luxembourg. In addition, the king of the Netherlands became hereditary beginning with the Grand Duke of Luxembourg. Belgium rebelled and gained independence in 1830, while the personal union between Luxembourg and the Netherlands was severed in 1890 as a result of ascendancy laws which prevented Queen Wilhelmina from becoming grand duke. The Netherlands possessed several colonies, most notably the Dutch East Indies (now Indonesia) and Suriname (the latter was traded with the British for New Amsterdam, now known as New York). These colonies were first administered by the Dutch East India Company and the Dutch West India Company, both private collective enterprises. Three centuries later these companies got into financial trouble and the territories in which they operated were taken over by the Dutch government (in 1815 and 1791 respectively). Only then did they become official colonies. During the nineteenth century the Netherlands was slow to industrialize compared to neighboring countries, mainly due to its unique infrastructure of waterways and reliance on wind power. The Netherlands remained neutral in World War I and intended to do so in World War II. Nazi Germany changed those plans when it invaded the Netherlands in 1940 in the Western European campaign of World War II. Subsequently the Netherlands joined the Anglo-French alliance. The country was quickly overrun and surrendered after the bombing of Rotterdam. During the occupation more than 100,000 Dutch Jews were murdered in the Holocaust along with significant numbers of Dutch Roma (gypsies). As in many other countries occupied by the Nazis, a Dutch Resistance arose that worked to sabotage the occupation of their country. The Allied 21st Army Group was given the task of conducting military operations to liberate The Netherlands after the Normandy. British, Canadian, Polish and American soldiers fought on Dutch soil beginning in September 1944. Allied focus shifted to the German heartland and the Netherlands was finally liberated on May 5, 1945 (just three days before the unconditional surrender of all German troops). The disruption of the war made the winter of 1944-1945 one in which malnutrition and starvation were rife among the Dutch population. After the war the Dutch economy prospered, leaving behind an era of neutrality and bonding with neighboring states. The Netherlands became a member of the Benelux (Belgium, the Netherlands and Luxembourg) cooperation. Furthermore, the Netherlands was among the twelve founding members of the North Atlantic Treaty Organization (NATO) and among the six founding members of the European Coal and Steel Community, which would later evolve into the European Union. The Netherlands formed part of the Roman Empire and the Holy Roman Empire and followed their religions. Before the advent of Christianity the area was populated by Celtic tribes in the South, which adhered to polytheism and Germanic tribes in the North, which adhered to paganism. After the Roman Empire occupied the South, mythology became important there, as well as religions from the Middle East, including Judaism, Mithraism and later Christianity. In the eighth century, Anglo-Saxon missionaries such as Boniface attempted to Christianize the land occupied by the Frisians. The Frisians resisted and Boniface was killed in 754. The missionaries gradually succeeded in the conversion of the North in the eighth century. In the Middle Ages, the Catholic Church became an important institution and by the year 1000 the Bishop of Utrecht had inherited half the Netherlands. During the Renaissance and the Reformation an independent Dutch religious tradition began to take shape in an independent Netherlands. In the fourteenth and fifteenth centuries, the first calls were heard for religious reform. Geert Groote established the Brethren of the Common Life, an influential mystical order. 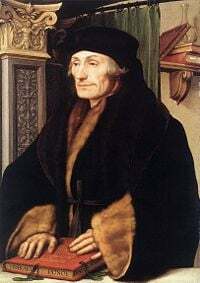 Another prominent reformer was the humanist Erasmus who harshly criticized what he considered the excesses of the Roman Catholic Church. The sixteenth and seventeenth centuries were characterized by the Reformation which greatly influenced the history of the Netherlands. The first wave of Reformation, initiated by Martin Luther, did not come to the Netherlands. The second wave of Reformation, Anabaptism, became very popular in the counties of Holland and Friesland. A prominent Dutch Anabaptist was Menno Simons, who initiated the Mennonite church. Another Anabaptist, Jantje van Leyden, became the ruler of a newly founded city, New Jerusalem. Anabaptists were recognized by the States-General of the Netherlands in 1578. Institutionalized Dutch baptism became a model for future English and American Baptist organizations. The third wave of Reformation, Calvinism, came to the Netherlands in the 1560s, converting both the elite and the common populations, mostly in Flanders. The Spanish government, under Phillip II began harsh prosecution campaigns, supported by the Spanish inquisition. In reaction this persecution, Calvinists rebelled. First was the Beeldenstorm in 1566, which involved the destruction of religious depictions in churches. In 1568 William the Silent, a convert to Calvinism, started the Eighty Years' War to liberate the Calvinist Dutch from the Catholic Spaniards. The counties of Holland and Zeeland were conquered by Calvinists in 1572. All churches in the Calvinist territories became Calvinist and most of the population in these territories converted to Calvinism. Because the Netherlands had ceded from Spain over religious issues, it practiced tolerance toward people of different religions and opened its borders for religious dissenters. Descartes, for instance, lived in the Netherlands most of his adult life. In the early seventeenth century, the Roman Catholic Jesuits began large conversion campaigns and the number of adherents of Catholicism grew, especially in rural areas. The cities became flooded with Protestant immigrants from Germany, Flanders and France and developed a Protestant character. Orthodox Calvinists had no interference from the liberals in the front-line areas bordering the Spanish Netherlands. They converted a belt of land from the southwest (the province of Zeeland), via the Veluwe, to the north city of Staphorst. This remains Orthodox Calvinist until this day. During the Twelve Years' Truce of 1609 through 1621, in the Eighty Years’ War, the Netherlands experienced a civil war along religious lines. The Synod of Dordrecht had attempted to bring an end to an internal theological conflict within the Calvinist church between the orthodox Gomarists and the liberal Arminians or Remonstrants without success, and war broke out in 1610. The liberal sovereign estates of Holland left the Republic. The orthodox side (Prince Maurice of Orange and the other provinces) won, resulting in the official head of state of the county of Holland, Johan van Oldebarnevelt, being executed. Calvinism became the official state religion and political offices could only be occupied by Calvinists. Other religions were tolerated, but couldn't practice their religion in public. In 1648 the independence of the Netherlands was recognized by the Treaty of Westphalia. The Netherlands became known for its religious tolerance and ultimately became a refuge for the persecuted and a home for many migrants. The number of first generation immigrants from outside the Netherlands in Amsterdam was nearly 50 percent in the seventeenth and eighteenth century. Jews had their own laws and formed a separate society. Many Jews, especially from Antwerp, migrated to Amsterdam. The Netherlands also hosted religious refugees, including Huguenots from France and Pilgrims from England. The revolution in the 1795, which established the Batavian Republic, brought equal rights and emancipation for all religions in the Netherlands. In 1813 the Calvinist Republic united with the Catholic Southern Netherlands to form the United Kingdom of the Netherlands. The union split in 1839 after the Belgian Revolution, which was partially motivated by religious differences between Protestants and Catholics. The position of Catholics of the Kingdom of the Netherlands again worsened, with the Catholic hierarchy being outlawed. The Netherlands was ruled by liberal Calvinist elite, which dominated the bureaucracy and the Dutch Reformed Church. 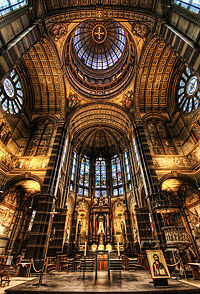 In 1886 a group of Orthodox Calvinists, led by Abraham Kuyper, split from the Dutch Reformed Church and in 1892 founded the Reformed Churches in the Netherlands, one of the major neo-Calvinist denominations. Kuyper also organized a whole range of religiously inspired organizations, inspired by the concept of the separation of church and state, sphere sovereignty. He founded an orthodox Calvinist newspaper, labor union, schools, a university and a political party. During this period Catholics began to do the same. The Netherlands separated between three religious pillars, an orthodox Calvinist, a Catholic and a neutral pillar. These were subcultures which did not interfere which each other. During the twentieth century, a separate socialist pillar would also develop. There was considerable religious tolerance between these subcultures and they cooperated with each other at the level of government, however that cooperation did not extend into the religious life. Jews had become fully integrated into Dutch society after the 1795. Most Jews were aligned with the socialist pillar. They formed a considerable minority: one eighth of the population of Amsterdam was Jewish. In 1940 the Netherlands was occupied by Nazi Germany. Most of the Dutch Jewish community was exterminated by the Nazis during this occupation. In February 1941, there was a general strike in Amsterdam and the surrounding areas against the first razzia. This was the largest act of resistance against the persecution of Jews during the Second World War. The main resistance groups were of Orthodox Calvinists and communists, although the other religions and ideologies also had their own resistance groups. An important action of the resistance movement was the hiding of Jews from Nazis. There were 140,000 Jews in the Netherlands in 1940. Twenty thousand of them were free from persecution because they were married to non-Jews, or because some of their parents and grandparents were non-Jews. Another 20,000 Jews hid from the Germans. From the 101,000 Jews that were deported, only one thousand were alive after the war. The percentage of Dutch Jews that were exterminated was much higher than in other countries, including Germany. Map of the Netherlands, with red dots marking the capitals of the provinces and black dots marking the large cities. The national capital is Amsterdam, and the national seat of government is The Hague. The Netherlands was a republic from 1581 to 1806 and a kingdom between 1806 and 1810 (it was part of France between 1810 and 1813). It then became a constitutional monarchy until 1815. It has been a parliamentary democracy since 1848. The head of state is the monarch (at present King Willem-Alexander). The monarch currently has a mainly ceremonial function but the constitution allows for the exertion of real power, should the responsible ministers subordinate themselves; an open conflict between them and the monarch—whose signature is needed for any law or warrant to come into effect—would lead to a constitutional crisis. Since the nineteenth century, Dutch governments have consisted of coalitions with no single political party being large enough to get the majority vote. Formally, the monarch appoints the members of the government. In practice, once the results of parliamentary elections are known a coalition government is formed (in a process of negotiations that has taken up to seven months), after which the government formed in this way is officially appointed by the monarch. The head of the government is the prime minister (in Dutch Minister President or Premier, a primus inter pares) who is usually also the leader of the largest party in the coalition. The parliament consists of two houses. The bicameral States General (Staten Generaal) consists of the first chamber or Eerste Kamer (75 seats; members indirectly elected by the country's 12 provincial councils for four-year terms) and the second chamber or Tweede Kamer (150 seats; members directly elected by popular vote to serve four-year terms). Political scientists consider the Netherlands to be a classic example of a consociational state, traditionally explained since the early Middle Ages by the necessity for different social groups to cooperate in order to fight the sea. This system of reaching an agreement despite differences is called the Polder Model in Dutch. The Dutch have a 'friendly' reputation in other countries, to the point that bearers of a Dutch passport often have relatively little difficulty getting into other countries for visits or even for emigration purposes. The Netherlands has seen a political upheaval in the early years of the twenty-first century, most clearly illustrated by the quick rise and fall of the right wing anti-immigration political party Lijst Pim Fortuyn. Pim Fortuyn, its founder, gained massive support with his populist views. Just before the election of 2002 he was murdered by an environmentalist activist, the first political murder in the country in about four hundred years. The elections, which sent the Netherlands into a period of political chaos, were concluded with Peter Balkenede becoming prime minister in July 2002. The Netherlands is divided into twelve administrative regions, called provinces, each under a governor, who is called Commissaris van de Koningin (Commissioner of the Queen), except for the province Limburg, where the commissioner is called Gouverneur (governor), underlining the more "non-Dutch" mentality. The country is also subdivided in water districts, governed by a water board (waterschap or hoogheemraadschap), each having authority in matters concerning water management. The creation of water boards actually pre-dates that of the nation itself, the first appearing in 1196. Dutch water boards are one of the oldest democratic entities in the world today. The Netherlands has a prosperous and open economy in which the government has reduced its role since the 1980s. Industrial activity is predominantly in food-processing, chemicals, petroleum refining, and electrical machinery. Slochteren has one of the largest natural gas fields in the world. A highly mechanized agricultural sector employs no more than four percent of the labor force but provides large surpluses for the food-processing industry and for exports. The Dutch rank third worldwide in the value of agricultural exports, behind the U.S. and France, with exports earning $46 billion annually. A significant portion of Dutch agricultural exports are derived from fresh-cut plants, flowers and bulbs, with the Netherlands exporting two-thirds of the world's total. The Netherlands also exports a quarter of all world tomatoes, and one-third of the world's exports of peppers and cucumbers. The Netherlands' location gives it prime access to markets in the UK and Germany, with the port of Rotterdam being the largest port in Europe. Other important parts of the economy are international trade, banking and transport. As a founding member of the Euro, the Netherlands replaced its former currency, the Dutch guilder, on January 1, 1999. The actual change to Euro coins and banknotes occurred on January 1, 2002. The Netherlands is the 16th largest economy of the world. Demographics of Netherlands, 2005. Number of inhabitants in thousands. The Netherlands is the 23rd most densely populated country in the world with 395 inhabitants per square kilometer (1,023 per square mile)—or 484 people per square kilometer (1,254 per square mile) if only the land area is counted, since 18.4 percent is water. Partly because of this it is also one of the most densely cabled countries in the world. Internet penetration is at 66.2 percent, the seventh highest in the world. According to CBS Statline, the official statistics bureau of the Netherlands, the vast majority of the population remains Dutch. 80.8 percent are Dutch, 5.6 percent are other Western European (including 2.4 percent German), 2.4 percent Indonesian (Indo-European, Indo-Dutch, Moluccan), 2.2 percent Turks, 2.0 percent Surinamese, 1.9 percent Moroccan, 1.5 percent East Indian, 0.8 percent Antillean and Aruban, and 4.2 percent other. This does not include the whole Kingdom of the Netherlands (such as the Netherlands Antilles and Aruba, which have a non-European majority community). 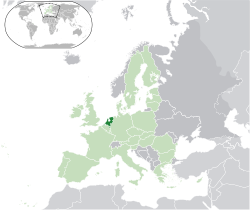 The Netherlands also has a resident population of some 200,000 people of mixed Dutch and Indonesian descent (Indonesia being a former colony of the Netherlands). There are no cities with a population over one million in the Netherlands, but the “four big cities” as they are called (Amsterdam, Rotterdam, The Hague, and Utrecht) are regarded as one “big city” agglomeration, called the Randstad (“fringe city”), with about seven million inhabitants. Eindhoven is the only of these cities that is not located in the Randstad. The population of the Netherlands is physically the tallest in the world, with an average height of 1.83 meters (6 feet) for adult males and 1.70 meters (5 feet 7 inches) for adult females. A few centuries ago, it was among the shortest. The reasons for the increase in height are uncertain (CBS 2006). The official language is Dutch, which is spoken by practically all inhabitants. Another official language is Frisian, which is spoken in the northern province of Fryslân. Frisian is co-official only in the province of Fryslân, although with a few restrictions. 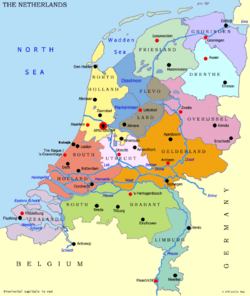 Several dialects of Low Saxon (Nedersaksisch in Dutch) are spoken in much of the north and east and are recognized by the Netherlands as regional languages according to the European Charter for Regional or Minority Languages. To the south, the Dutch language shifts into other varieties of Low Franconian languages and German, which may or may not be best classified as Dutch, most notably the West Flemish language. One of these, Limburgish language, which is spoken in the southeastern province of Limburg (Netherlands), has been recognized as a minority language since 1997. There is a tradition of speaking foreign languages in the Netherlands: about 85 percent of the total population speaks English, 55–60 percent speaks German and about 17 percent speaks French. These percentages do not represent fluency, but basic knowledge. According to the governmental statistics agency, Statistics Netherlands (CBS), 30 percent of the population consider themselves to be Roman Catholic, 20 percent Protestantism (predominantly Dutch Reformed) and eight percent “other denominations.” Forty-two percent consider themselves unaffiliated. Church attendance, however, is much lower than these figures may suggest: some 70 percent of the population “rarely or never” visit a house of worship (be it a church, mosque, synagogue or temple), and even then it is mostly for occasions such as weddings and baptisms. Most Protestants live in the northern provinces while the southern provinces, North Brabant (Noord-Brabant) and Limburg (Netherlands), are mainly Roman Catholic, along with some regions in the east of the country like Twente in Overijssel. The largest of the “other denominations,” at 920,000, are Muslim immigrants mostly from Morocco and Turkey. The other denominations also include some 200,000 Hindus (1.3 percent of the population), mostly descendants of indentured servants who migrated from India to the former Dutch colony of Suriname around 1900. During the Nazi occupation in the Netherlands in World War II, about 100,000 out of 140,000 Dutch Jews were murdered in concentration camps. The Jewish population of the Netherlands today is estimated at between 30,000 and 40,000. The spirit of humanism of the sixteenth to eighteenth century figures such as Erasmus and Hugo Grotius continues to influence the culture of the Netherlands today. A blend of religiousness and scientific progress has resulted in a pragmatic society which is committed to equality, compromise and avoiding conflict. The considerable hospitality exhibited by the Dutch is accompanied by openness for new ideas and a strong sense of tolerance. Dutch obsession with equality and keeping everything "normal" is reflected in one of its most famous sayings: Doe maar gewoon, dan doe je al gek genoeg (“Behave normally, that's mad enough”). The bicycle is one of the most common ways of getting around in the Netherlands. Since the general lay of the land is flat, it is perfect for a bicycle culture. Separate bicycle highways are found along the freeways, away from the high-speed traffic. Within the towns and cities are separate lanes and even traffic signals for cyclists. People of all ages use their bicycles to get from place to place. Automobile ownership is very expensive, and the price of gasoline in the Netherlands is the highest in the world because of heavy taxes. The Netherlands has had many well-known painters. The seventeenth century was known as the age of the "Dutch Masters." Renowned painters such as Rembrandt van Rijn, Johannes Vermeer, Jan Steen and many others rose to prominence. Famous Dutch painters of the nineteenth and twentieth century were Vincent van Gogh and Piet Mondriaan. M. C. Escher is a well-known graphics artist. Willem de Kooning was born and trained in Rotterdam, although he is considered to have reached acclaim as an American artist. Han van Meegeren was an infamous Dutch art forger. The Netherlands was also the home of philosophers such as the great Erasmus of Rotterdam and Baruch Spinoza. All of René Descartes' major work was done here. The Dutch scientist Christiaan Huygens (1629–1695) discovered Saturn's moon Titan and invented the pendulum clock. In the Dutch Golden Age, literature flowered as well, with Joost van den Vondel and P. C. Hooft being the two most famous writers. In the nineteenth century, Eduard Douwes Dekker (known by his pen name of Multatuli) wrote about the poor treatment of the natives in the Dutch colonies. Important twentieth-century authors include Harry Mulisch, Jan Wolkers, Simon Vestdijk, Cees Nooteboom, Gerard van het Reve and Willem Frederik Hermans. Anne Frank's The Diary of a Young Girl was published after she died in the Holocaust and translated from Dutch to all the major languages. Replicas of Dutch buildings can be found in Huis ten Bosch, Nagasaki, Japan. A similar Holland Village is being built in Shenyang, China. ↑ Wat is het Koninklijk wapen of Rijkswapen? (Google translate). Official Dutch government website. Retrieved November 21, 2011. ↑ 2.0 2.1 World Factbook (3 August 2010). Netherlands. CIA. Retrieved November 21, 2011. ↑ GovType. United States Department of State website. United States Department of State (16 July 2010). Retrieved November 21, 2011. ↑ 4.0 4.1 4.2 4.3 Netherlands. International Monetary Fund. Retrieved November 21, 2011. ↑ Central Intelligence Agency, Distribution of Family Income - GINI Index World Factbook. Retrieved November 21, 2011. ↑ Coat of Arms of The Netherlands GreenwichMeanTime.com. Retrieved November 21, 2011. ↑ Wet gebruik Friese taal in het rechtsverkeer (in Dutch). wetten.nl. Retrieved November 21, 2011. ↑ 8.0 8.1 Invoeringswet openbare lichamen Bonaire, Sint Eustatius en Saba (in Dutch). wetten.nl. Retrieved November 21, 2011. ↑ Sayle, Murray. 2001. “Japan Goes Dutch.” London Review of Books. Retrieved March 24, 2007. ↑ Pinckaers, Marcel. USDA Foreign Agricultural Service. 2005. The Benelux Horticulture Market. Retrieved March 24, 2007. ↑ Countries with the Highest Internet Penetration Rates. Internet World Stats.com. Retrieved June 1, 2007. All links retrieved November 16, 2018. Netherlands CIA, The World Factbook. History of the Netherlands: Primary Documents Euro Docs. Ramerini, Marco. Dutch Colonial History Colonial Voyage. This page was last modified on 16 November 2018, at 16:25.